Xoar International is a company with 40 years of experience in manufacturing propellers for both RC hobbyists and commercial applications, from RC airplanes and multirotors, to large industrial UAVs, powered parachutes and even ultralight aircraft . Xoar propellers have been known to the industry as one of the most efficient & stable propellers. After sporting their props on some of our smaller frame machines, we have finally gotten an opportunity to get our hands on a couple of sets of their PJP-T-L 18×6.5 low motor Kv, lightweight carbon fiber propellers. 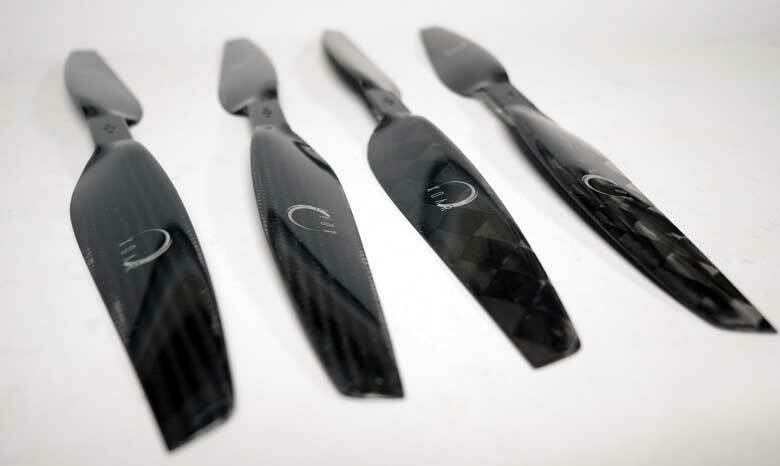 These lightweight CF props are available in sizes ranging from 12 to 40 inches, covering a wide variety of multirotor applications. 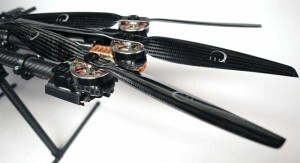 Xoar’s larger size low Kv props seem like a great option for the increasingly popular heavy lift coaxial builds designed to carry large payloads. I decided to test these propellers on my Tarot T960 hexcopter sporting 330Kv motors and 1755 Tarot propellers. I found the 1755 fairly decent for the price, but have experienced some chipping around the prop hubs and fairly slow response from the copter; all that at the same weight as Xoar’s 18 x 6.5s. 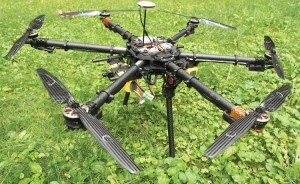 The 18 inch prop is the maximum size that this 960 frame hex can accommodate, leaving about an inch of space between the tips. My expectation of this upgrade is more agility thanks to the larger and higher pitch props, preferably without a significant loss in flight time. My hope was to experience enough of a difference to justify the price tag. While the Xoar props are not the most expensive props available, they cost considerably more than the low end props available on the market. Before the installation, I checked their balance using my Du-Bro precision balancer and found the propellers pretty well balanced out of the package. The props mounted easily to the motors using the Tarot’s prop hub/cover and a couple of 2.5x10mm screws and I was off to the races. I removed the camera and the gimbal for the test and replaced them with a 1.5 Kg dummy weight to simulate the payload. I started the motors and looked at each individual prop from the side to check for any bowing (bent props will create two “travel lines” in the air), but found nothing unexpected. I noticed a significant difference in the speed of the copter immediately after takeoff . The copter seemed to fly effortlessly and was noticeably more agile, yet quieter. I decided to put the props through a bit of abuse to see if they could handle it, but they had no problem soaking up some seriously spirited flying. I would not consider putting my SLR machine through these paces during its regular use, so this test left me confident that the props can withstand even more extreme handling. The motor and ESC temperatures were more than acceptable at the end. After this flight, I proceeded to fly another set of batteries, simulating more normal use of the copter, to see if I can pick up any difference in flight time. In this test, I did not notice any statistically significant change in flight time. The props have passed my test with flying colors (no pun intended). The copter felt locked-in and the props provided a noticeable improvement in agility and noise abatement without any detriment to the flight times. I would recommend these props to anyone who is looking for quality, lightweight CF propellers at a competitive price from an established manufacturer. If you’ve got a heavy lifter and want it to run better, check Xoar out.